View More In Power Inverters. Ultimate car power inverter for road trips, vacations, outdoors, emergency kits and more for your car. This power inverter converts DC 12V to AC 110V and features of 4 USB ports and 2 AC outlets for multi-purpose charging. 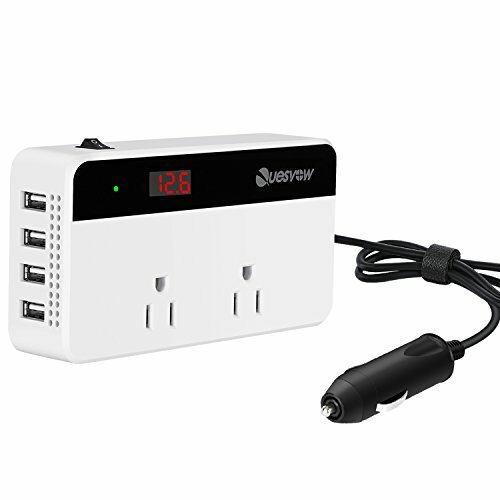 Three 110V AC outlets for charging larger devices such as laptops and tablets, four USB charging ports for powering USB compatible devices. Ultra compact and lightweight design is ideal for use on vacations, work trips, and camping. universal cigarette lighter plug makes the power inverter can be plugged into almost any 12V car. Mufti-protection:Safe charging design provides protection against overheating, under and over voltage charging, short circuiting, overloads, and overcharging. Please do not leave the power inverter in the ON position while your car is off. Please understand device wattage usage Caution! Do not use high power electric devices such as hair dryers, electric heaters, curling irons, etc. The LED indicator light indicates shut down caused by low or high voltage, overload or excessive temperature. If you have any questions about this product by Quesvow, contact us by completing and submitting the form below. If you are looking for a specif part number, please include it with your message.